Are you tired of your finances being out of control? Do you want to finally take the steps needed to improve your finances and take control of your finances? Even if you answered yes to this question, you probably aren’t taking any action to change your financial life. You think it is too hard or it is too overwhelming to think about all of the changes you are going to need to make. But the truth is, you can improve your financial situation a lot easier than you think. And you will see major improvement in a short period of time too. You just have to make sure you are focusing on the right things. All too often, you get excited to take control of your finances and fall flat on your face, all because you went about it the wrong way. I’ll admit to this myself. I’ve made just about every mistake there is to make. I’ve been stuck in the credit card debt cycle where I pay off my debt only to find myself knee deep in debt a few months later. I’ve been lured into the stock market only to lose the majority of my money. And I’ve even bought a ton of stuff that I thought I wanted, only later to regret, which pushed me further behind financially. Eventually I had enough. I started reading more about personal finances and created a plan to change my financial life once and for all. Today I am going to share the plan I created with you. It helped me go from being in debt of more than $10,000 to having close to $1 million in savings. And I did this in less than 10 years. In fact, I was debt free and had money in the bank in just 1 year. If you want to finally take control of your finances and break free from the stress money has over your life, keep reading to learn the simple steps you need to start taking today. The very first step in taking control of your finances is to start putting money away. This money can be used to cover you in the event your car breaks down, your furnace goes out, or any other reason. But how can you start to save money when you are living paycheck to paycheck? The truth is you have some money you can save. You just think you don’t. So right now, start to save money. Even if it is just $10 a month, save something. No matter how tight money is for you, you can afford to save $5 or $10. You can probably even save $20 a month. Once you decide on the amount, head to CIT Bank and open your free savings account. They pay one of the highest interest rates on your savings and this means your money is going to grow faster when you save with them. I use them and absolutely love them. I was using another bank and not earning any interest. Now I make money every single month. You can click here to get started, and once you have your account opened and a monthly transfer set up, you can come back to read the rest of the steps to improve your financial life. Now, before you question if $10 or $20 is even going to make a difference, it will. It might not seem like it right now, but ask most anyone with wealth how they got started and they will all tell you the same thing. They built their wealth by starting to save a little bit of money every month. See, $20 a month doesn’t sound like much. But in a few years, you are going to have more than $1,000. Then when something breaks and you need to repair it, you will have the money. You will notice that the stress you usually feel is gone. You can keep living your daily life without interruption. Or you might come across a great opportunity. In the past, you never could take advantage when one presented itself. Now you can. Stop limiting yourself by thinking short term, and start to see the possibilities. The next step to a better financial situation is to know where you stand. This means taking the time to calculate your net worth. Just what is your net worth and why is it important? Your net worth is the difference between your assets and your liabilities. In other words, you take the things you own that are worth money and you subtract out any debts you have. The resulting number is your net worth. The higher the number the better as this means you are smart with your money. Having a low or negative net worth means you are overspending and are not smart with your money. For example, let’s say you have $1,000 in the bank and you have $3,000 in credit card debt. You would have a negative net worth of $2,000. This tells you that you need to curb your spending and start saving more money. The reason you should calculate your net worth is because it will help you to measure your progress in changing your financial life as you build your wealth. As you save and invest money and pay off your debts, your net worth will rise. I calculate my net worth monthly, but you don’t have to calculate yours this often. You can calculate yours once or twice a year. But you can calculate it monthly too if you want. When I started calculating my net worth, mine was negative $23,000 thanks to my student loans. But I was determined to first get to zero. I focused on paying off my student loans and saving as much as I could. By keeping track of my net worth, it helped to keep me motivated. Once I got my net worth to $0, my next goal was $25,000. As I reach each goal, I set a new one and kept going. For me, tracking my net worth is a fun thing to do. What is the best way for you to calculate your net worth? You can manually calculate it yourself or you can use let someone do it for you. If you want to do it yourself, there are many free templates to use online. If you want someone else to do it for you, then your best option is Personal Capital. Just open your free account and link your accounts. From there, Personal Capital will update your net worth in real time. It really is the best way to calculate your net worth since you only need to log into your account to see your net worth. Click here to get started with Personal Capital. You are now savings some money every month and you are calculating your net worth. Your next step to improve your finances is something I mentioned earlier. You need to start focusing on the long term. Here is what I mean by this. Too many times you only look at the short-term consequences of your actions. You completely ignore the long-term. For example, you do some quick math and determine that you can afford to spend $500 a month on a car payment. You head to the dealer and tell the salesperson what you can afford per month and they show you some cars. You find one you like and as long as it meets your monthly payment, you sign on the dotted line. You probably think nothing is wrong with this. By only looking at the monthly payment (the short-term), you ignore the overall cost of the car. If instead you went in knowing the most you are willing to spend overall (long-term), you save money. Let’s say instead of looking at the monthly payment, you focus on the overall cost and are comfortable with spending a total of $30,000 on a car. Here is how the two compare to each other. 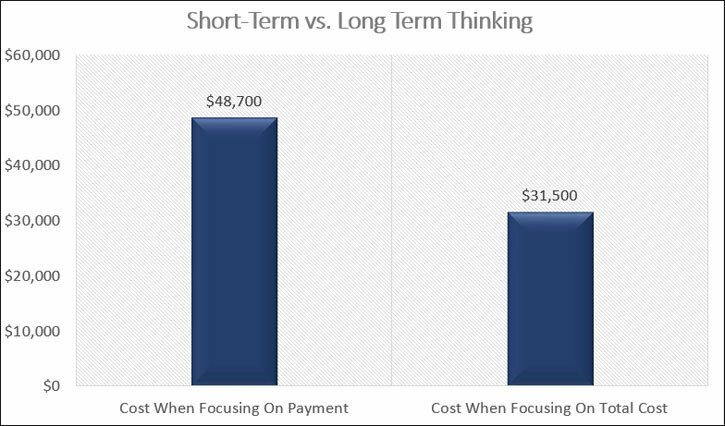 By focusing on the short-term, you bought a $45,000 car and paid a total of close to $49,000. But by looking at the long term, you bought a $30,000 car and paid a total of less than $32,000. The end result is you pay off your car much sooner and save a grand total of $17,000! Start to work on looking at the long-term consequences of your financial decisions. It will take a little effort in the beginning but once you make it a habit, you will do it without thinking. If your finances are out of control, chances are you are in debt. In order to change your financial situation for the better, you need to get out of debt. After all, when you are in debt, all of your hard work and the money you earn is for someone else. Think about that for a minute. If you earn $500 a week and owe $2,000 on your credit card, you are going to work an entire month just to pay off that credit card. You won’t be earning money for yourself. All of it is for the credit card company. Therefore, you are essentially working for the credit card company. But when you pay off your debt, you are working to pay yourself. And if you are smart and save as much money as you can, you can quit working one day. By staying in debt, you will never get to quit working. You are always going to have to earn an income because you owe someone else money. So what is the best way to get out of debt and change your financial life? There are many options out there, but the best one is the debt snowball. The debt snowball is when you organize your debt from smallest balance to largest and pay the minimum on everything but the smallest balance debt. On your smallest balance debt, you pay as much as you can so that you pay it off completely in a short amount of time. Once it is paid off, you repeat the process on your next smallest debt. This method works because it keeps you motivated to pay off your debt. When you have $10,000 like me, sending in a couple hundred dollars a month gets discouraging fast. I thought I was never going to get out of debt. But when I started to use this plan, I quickly paid off one debt which motivated me to keep going. As I paid off each debt, more money was going towards my larger balance debts, helping me to pay these off faster. If you are in debt, I highly recommend you follow this plan to improve your finances. We now come to the step that is all about your spending. I am not going to ask you to start a budget here, but it wouldn’t be the worst thing if you did since knowing where your money is going is a great way to change your financial life. Instead, I am asking you to take a little time to understand what you value in life. Back when I got myself into credit card debt, I was buying name brand clothes and the latest electronic gadgets because I thought having these things made me happy. All they were doing was adding to my mountain of debt. Once I took the time to understand what I value in life, I was able to stop spending mindlessly on things and started enjoying life more. I am asking you to take some time and figure out what makes you happy. What are the things you love to do? What do I enjoy doing in my free time? What are some things I wish I were doing instead of working? By asking yourself these questions, you will get a better idea of what you value in life. Then you can focus on spending your money on these things and stop spending your money on other things. When I did this exercise, I realized I am happiest spending time with my friends. I set up a monthly get together and had dinner together. The happiness that resulted was incredible. Spending this time with them was the highlight of the month for me. And since I knew what I valued, I stopped spending money on brand name clothes and the latest electronics. It was easy to do so because I knew they didn’t add value to my life. I also knew this because I often had buyer’s remorse after buying them. By no longer wasting my money on things that didn’t bring me happiness, my spending dropped dramatically and I was able to put more money towards my debt and savings every month. Take the time to understand what you value in life and watch your spending transform for the better. In order to improve your finances, you need to start to build your wealth. While getting out of debt and saving some money each month is great, you need to take the next step towards building your wealth. This is where investing comes in. 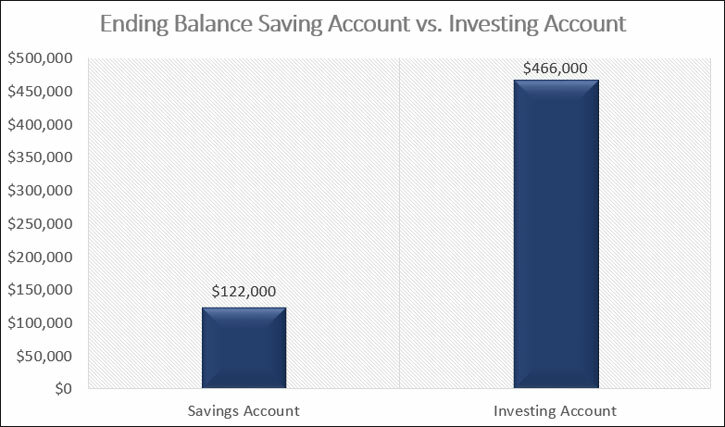 When you invest your money, you grow it at a much higher rate than with a bank savings account. And this growth matters in the long run to bettering your financial life. For example, let’s say you have $100,000 saved. You can keep the money in a savings account for 20 years, earning 1% annually, or you can invest this money and earn 8% for 20 years. How much money do you have after 20 years? That’s right, you have more than $300,000 more by investing your money. Just think for a moment how much longer and harder you would have to work to earn another $300,000. That is what you would have to do in order to have the amount of money you could if you started investing. You might be thinking this is great, but the stock market scares me, or I lose money when I invest. I understand. I lost a lot of money in the stock market too. When I was younger, I got caught up in the hype of the dot com era. I invested everything I had into a hot technology mutual fund. Unfortunately for me, I invested just as the bubble burst and lost over 60% of my money. Then I invested in a hot stock. As the price dropped, I invested more. And then more. I did this until news broke that the company was altering their financials and the company and the stock went bankrupt. Yet here I am, with most of my money invested in the stock market. What did I learn? I realized that I am much better at just investing in a way that tracks what the market does. Trying to pick the next hot investment is a waste of my time. Instead I pick a few index funds and invest money into them every single month, regardless of what the market is doing. The result is a tremendous growth of my money. Yes, I do lose money when the stock market drops, but I keep one thing in mind. 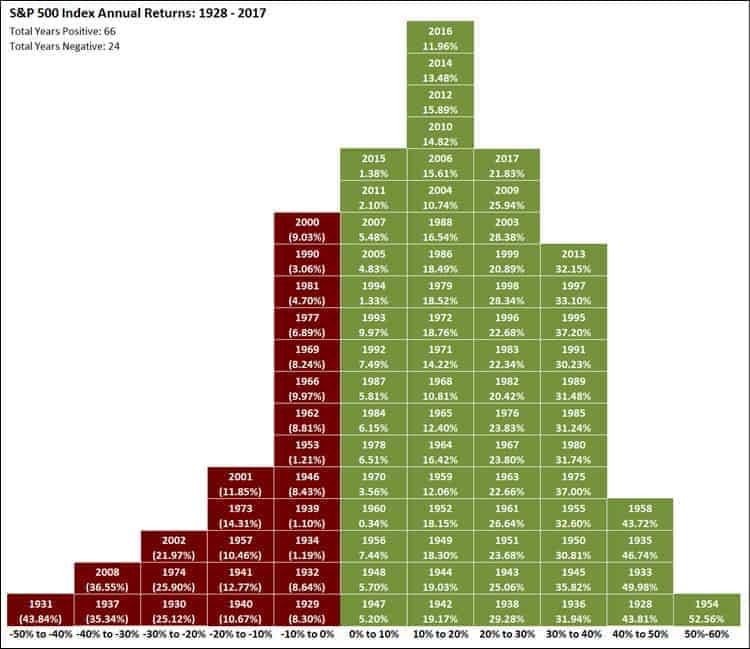 Over time, the market goes up more than it goes down. In other words, refer back to step #3 and start focusing on the long-term and less on the short-term. Your next question is probably what is the best way for me to get started investing? I recommend you look into Wealthsimple. They make investing simple by doing all of the work for you. You spend 10 minutes opening your account and asking a few questions. From there, they pick an investment model for you and you are set. All that is left for you to do is to pick a monthly investment amount, which can be as little at $10. But here is what really makes Wealthsimple shine. They also allow you to invest your spare change. When you buy something for $14.18, Wealthsimple will round up the purchase to $15.00 and transfer the $0.82 to your account and invest it for you. It might not sound like a big deal, but take a minute to look over your monthly spending. 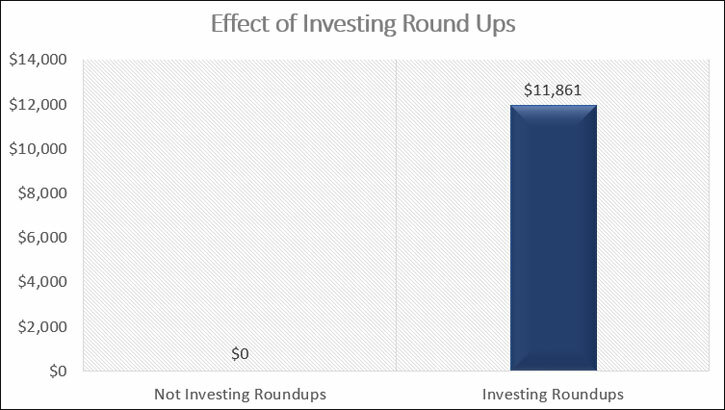 My guess is through round ups alone, you will be able to invest close to an extra $20 in spare change every month. Here is the impact this will have on your wealth in 20 years. By just rounding up your purchases, you can end up with an extra $12,000! Best of all, you don’t have to do any work to get this extra money. Wealthsimple does it for you! To get started with Wealthsimple, click here. The last step in the process to a better financial life is to begin to earn more money. When you earn more money, you can pay off your debt faster and you can save and invest more money. In time, this leads to greater net worth and greater wealth. Just look at the chart below. If you earn $40,000 and save 20% a year ($8,000), in 20 years you have $160,000. 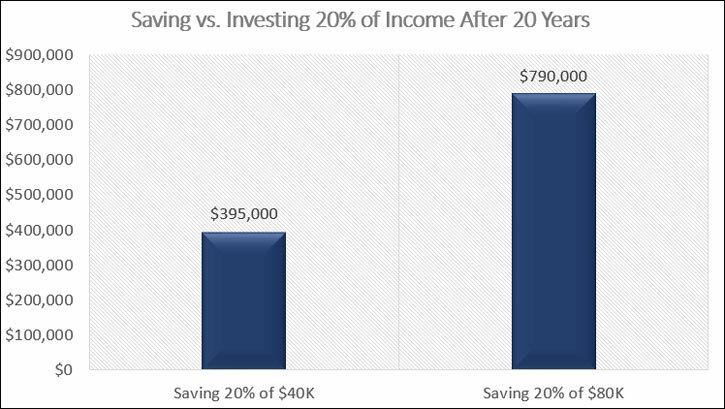 But if you increase your income to $80,000 a year and still only save 20% a year ($16,000), in 20 years you have $320,000. And this isn’t taking into account the growth of your money. 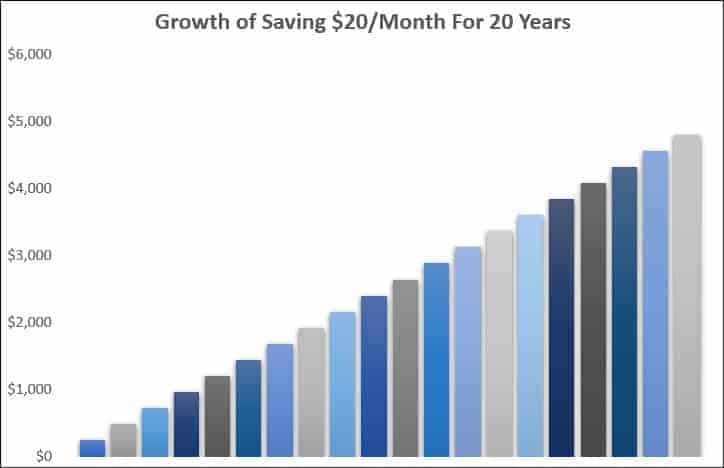 If you were to invest this savings and earn 8% for 20 years, here is how much you end up with. Talk about a lot of money! When you earn more money, you can save more money, which allows you to grow your wealth faster. Let’s look at how each of these will change your financial life. Increasing your salary isn’t as difficult as many people think. You just have to step outside of your job description and become valuable at work. Start taking on new responsibilities at work. Join teams to work on projects. Look for ways to save the company money. As you do these things, keep a record of it and schedule a meeting with your boss. Don’t wait until your annual review. By then it is too late. Schedule your meeting in the summer and explain the ways you’ve gone above and beyond your job description and that you would like to earn a larger raise. Be open and have a conversation about it. Take their advice and suggestions and work hard to follow through. By doing this, I was able to regularly earn 5% raises at my last job. Sometimes if you do this and find your company isn’t willing to offer you a higher raise, you may need to start looking elsewhere. In this case, be sure to update your resume to include how you stepped out of your job description. You will find that by switching employers, you will earn a decent increase in salary. Then you can use the above guide to start earning larger raises at your new company. Your next option for increasing your income is to work a side gig. This is where you find something enjoyable that earns you extra money. Understand you won’t be making thousands of dollars a week doing most side gigs. But you can make a few hundred or even a thousand a month. And in time, this extra income adds up. When I started to earn money from a side gig, I didn’t budget for it. What I mean by this is that I kept living off the money I earned from my day job. All the money I earned from my side gig was invested. After a few years of doing this, I really saw the impact this extra money had on my bottom line. I was investing an extra $10,000 a year and after 5 years I had more than $50,000 in savings. The best part was I was doing something I enjoyed so it never felt like work to me. If you want to get started making money on the side, I encourage you to look into the Fast Track to Side Income course. It’s a self-paced course that will teach you step-by-step how to make extra money on the side every month. There is your step-by-step guide to improve your financial life. This is the plan I used to go from $10,000 in debt to close to $1 million in savings and I am confident you will have great results too. Just remember that your financial situation won’t dramatically change overnight. It will take time. But it will change for the better sooner as long as you take action now. It’s a new year and you want to make a change, so start now. Go through each step and watch as you build savings, pay off debt, and become smarter with money. Just look back at step 7 for an example of what potentially lies ahead if you do take action. What would your life look like if you had $800,000 in savings? It can be a reality if you take the steps I outline in this post.